While San Diego is a historical maritime hub, with enviable weather and direct deepwater access to the Pacific Ocean, the growth of its “Blue Economy” needed a single, seemingly simple push. A name. “That study is now five years old, and it is my understanding they are working on an update; it’s my feeling that the numbers will be larger across the board,” said Cox. The San Diego Blue Economy is as diverse as you will find anywhere in the world. The U.S. Navy has a large and growing presence, it houses a burgeoning base of commercial entities including ship and boat building and repair, and it is home to Scripps Institute of Oceanography, one of the most prestigious institutes for study and research in the world. But the fishing industry, with a strong heritage of Portuguese, Spanish, Mexicans and Chinese, is its soul. To that end, Cox took particular interest when local fishermen at Tuna Harbor were having problems selling their fish to the public when they couldn’t get proper permitting from the Department of Environmental Health, primarily because the port district didn’t have a classification for leasing space for these fishermen. The permitting was temporary for more than a year until Toni Atkins, who at the time the speaker of the assembly but is now a state senator, drafted legislation which she called ‘Pacific to Plate.’ It changed state law so anywhere in California fishermen can sell their catch direct to the public. “It has been great success at Tuna Harbor, and that’s just one of the success stories,” said Cox. Cox said the Blue Economy isn’t relegated simply to those that is directly the water. 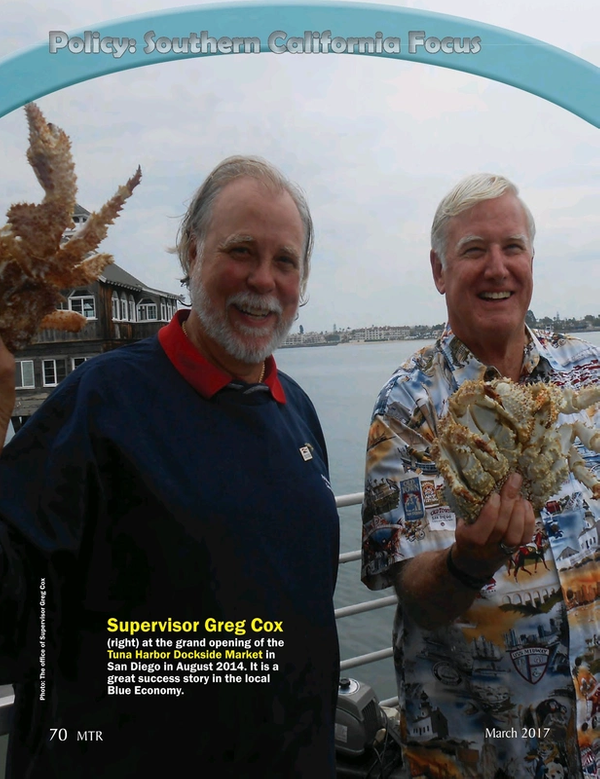 “In San Diego County we have many ‘blue economy’ businesses that are inland,” said Cox. “These are jobs – blue collar and white collar jobs – that includes a wide range of sectors, from fishing to shipbuilding to underwater robotics and telecommunications. It’s a wide swath of career opportunities.” While Cox has the responsibility to facilitate growth in his region, he realizes that the business is global, and ultimately the industry in his region can grow stronger with collaboration and cooperation. For companies looking to export beyond the Southern California borders, or enter into cooperation with businesses and organizations in his area, he offers a simple piece of advice and conduit. “I have become a strong advocate and supporter of The Maritime Alliance,” said Cox. “The Maritime Alliance has done an outstanding job in promoting blue tech and blue jobs, by focusing not only on businesses, but also on education, and policy as well as technological resources. By its very nature the blue economy is international,” and The Maritime Alliance does a great job in helping to bring them all together.